Our 3 pack of medical id sports bands gives your child a variety of bands to wear and our medical id sports band is great for kids and young adults and are perfect for everyday wear. 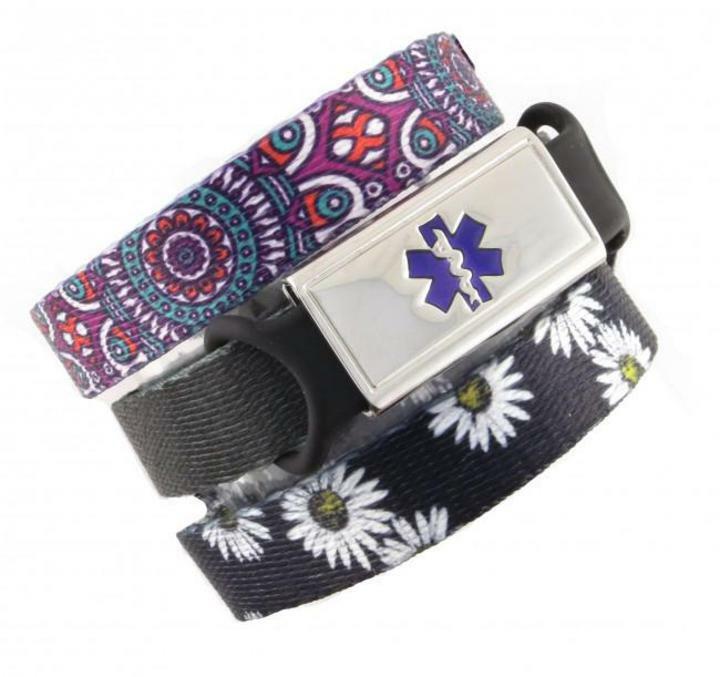 This 3 pack inlcudes Daisy Print, Solid Black and a print in colors with almost flower like symbol design, the tag with your choice of emblem color, and a silicone holder that is available in different colors, and its great so that the metal does not touch the skin. They are made of nylon webbing and adjustable with a plastic center release buckle. Even though this band is classified as a children’s medical bracelet, it can also fit up to a size 6.5 inch wrist. Excess length may be cut and melted with a heat source to keep the webbing from fraying.